Towards the end of the 2015 season we began to notice increasing levels of vibration through the tiller. There has always been some play in the upper bearing but the clearance did not seem to have increased and pressing the tiller laterally did not seem to reduce the vibration, so we suspected something else. When we hauled out at the end of the season one of my first actions was to inspect the lower bearing of the rudder for clearance, which I found to be quite considerable, 2 – 3 mm possibly. 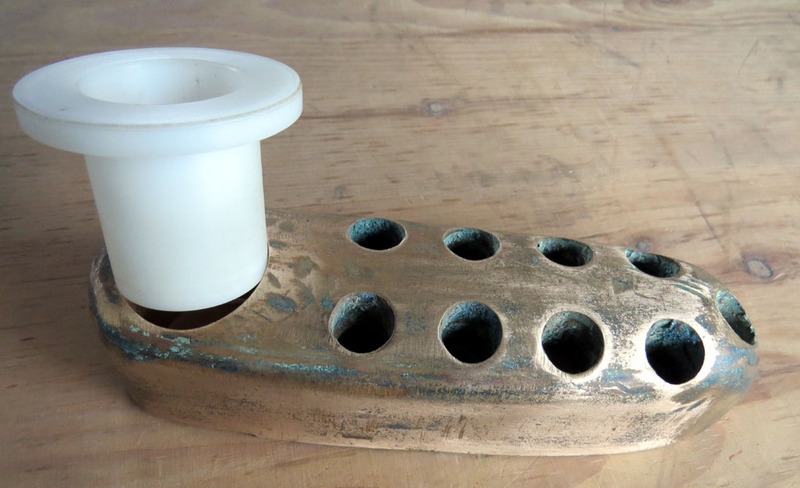 The lower land of the rudder is supported in a bronze shoe that is bolted to the skeg by a total of nine slot-headed bolts. With little hope that these would release I tried a large screwdriver of suitable size on them and to my surprise every one came out. The set screws are around 10 cm in length, made in a grade of stainless steel, all in good condition having been bedded in a sealant. The shoe released without problems and the rudder was not too heavy for me to lift while a timber support was placed beneath it. Base of the rudder showing the shoe attached to the underside of the skeg. Note the wear in the bearing bore. The shoe and bolts after removal. Wear of the bearing is clearly visible as an oval shape. The thrust bearing that should be between the rudder and shoe was missing. 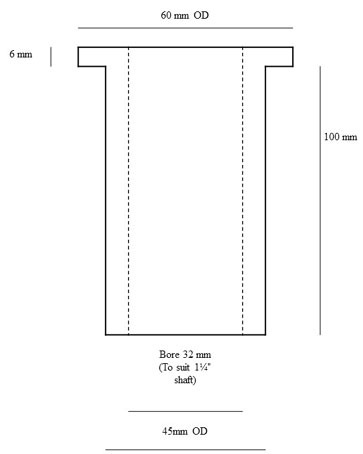 I measured the diameter of the rudder shaft and found it to be between 31.65 and 31.70 mm, equivalent to 1.25 inch. Fortunately wear was minor and no machining was necessary. I brought the shoe home with me to have a suitable repair made. 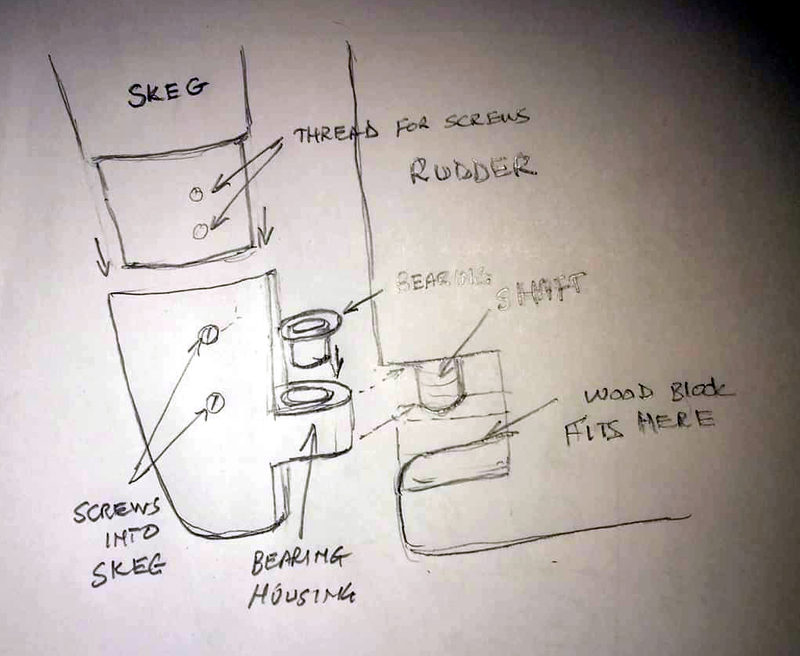 I also posted a request for information on the Sadler and Starlight Owners’ Association web forum, from which I received very useful information from John Moncreiff, another 34 owner, who had repaired his rudder bearings some time previously. John removed his rudder in order to replace all bearings, which rather surprisingly includes a third one at the hull immediately above the rudder. Removal of the rudder requires that the skeg be removed from the hull due to the taper of the rudder from top to bottom. The rudder cannot be dropped straight out although it may be that it can be lowered sufficiently for the top bearing to be replaced. I took the rudder shoe to BBH Precision Engineers in Bangor, Gwynedd, 01248 362705 where I have had work done previously. My metric shaft dimensions converted precisely to Imperial 1.25 inches and a sleeve made in Acetal was turned up to fit the shaft and the over-bored shoe. A thrust collar was included in the design although this was not present in the original. This drawing of the top and intermediate bearings was kindly provided by John Moncreiff. John tells me that the original bearings were two inches long but he extended to four inches to take up wear in the stock. One bearing was turned for me to install in the upper position, in the hope that I will be able to lower the rudder sufficiently to install it without removing the skeg. The OD is 1.75 inches. This surface was grooved to allow me to bed the bearing in epoxy if it proves necessary. I have turned two thrust washers of bore 1.25 inches and OD 1.75 inches in sheet PTFE 3 mm thick. I may not need these as the new bearing has thrust provision but I thought it best to be prepared. Although neither my boat nor John’s had a thrust washer between the shoe and the rudder, another 34 that I checked did have one. There is a thrust washer at the top of the rudder with a large clearance, suggesting that maybe the original lower thrust washer has broken up. Having returned to the boat I found that the rudder cannot be lowered sufficiently to replace the top bearing without also removing the skeg. I was unwilling to go this far at the time, so only replaced the lower bearing. This has resulted in a considerable improvement in the feel of the rudder and an almost total reduction in lateral movement at the tiller. 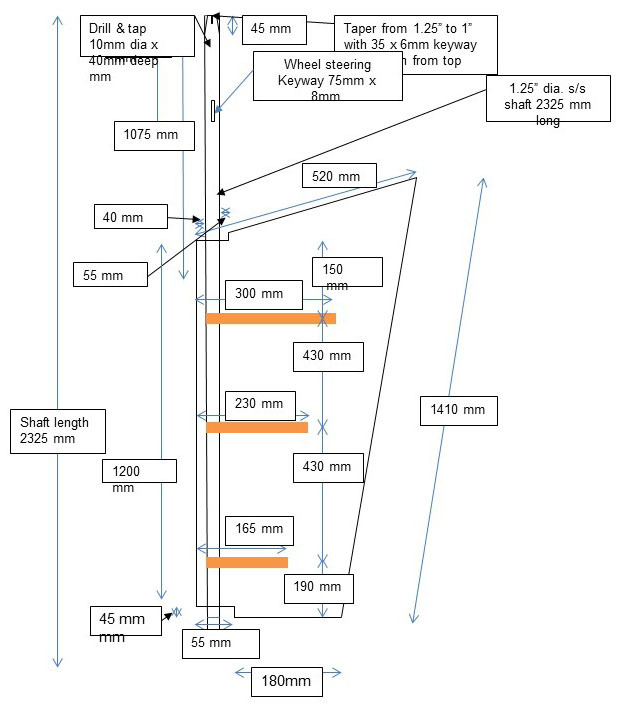 Diagram showing all the dimensions of the 34 rudder, made and kindly provided by John Moncreiff. There are normally four 10mm counter-sunk machine screws on each side of the casting that forms the bearing housing. These are screwed into the bottom of the skeg. Be aware that a few rudders do not follow this design. The screws should be removed using best engineering practice, i.e. all paint should be cleared from the slot, the screwdriver should the correct, large, size and be a good fit for the slot. 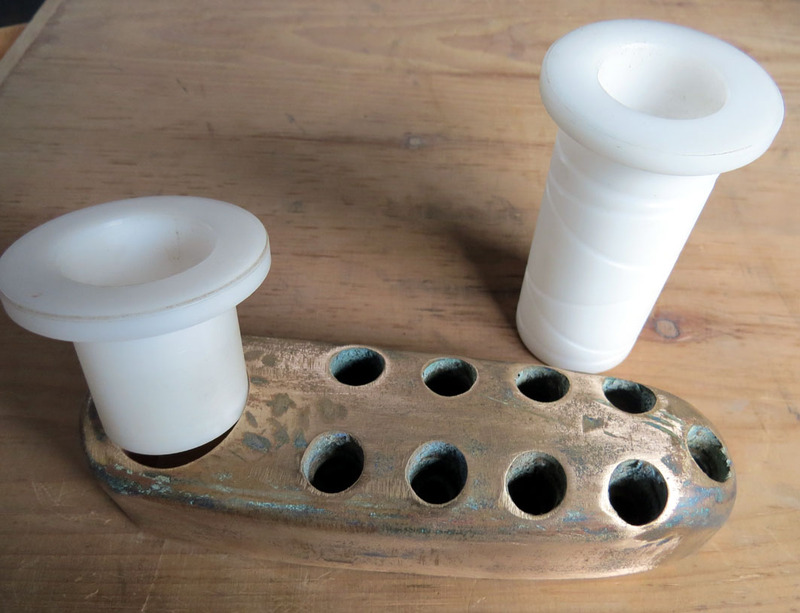 It may pay to file or grind the slot to the optimum shape and depth before trying to remove. In some cases heat from a blowlamp may be required. Several owners have reported the removal of the screws to be by far the most time-consuming part of the job, taking as long as two days. 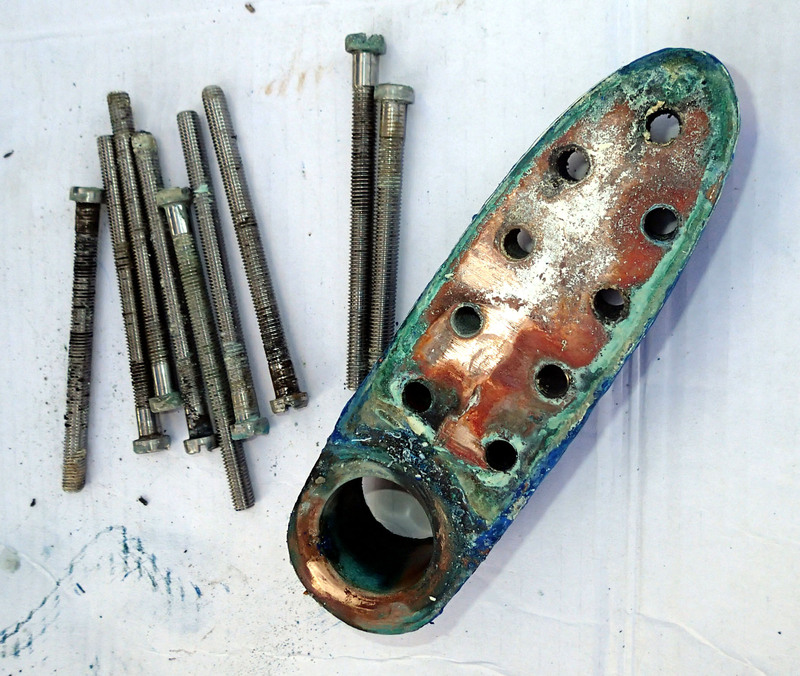 Once all the machine screws have been released the casting can be removed from the skeg. 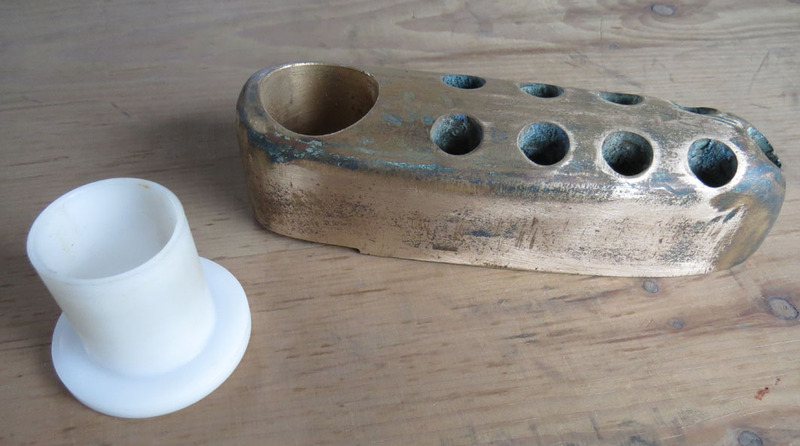 This casting is drilled and bushed to form a bearing around the rudder stock. The casting is removed from the rudder by cutting away the shaped piece of hardwood on the rudder, immediately below the casting. 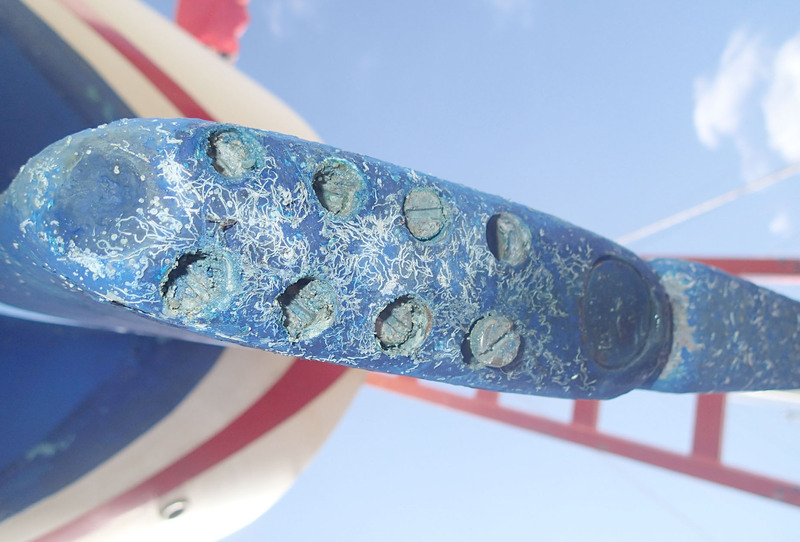 The wood is held in place by a screw that may be covered by layers of antifouling paint. Removal of the wood will free the casting from the bottom end of the rudder stock. The casting can then be re-bushed. As with the 34 rudder detailed above, acetal is the ideal material for this bush. If the hardwood block has been destroyed during the removal process it is relatively easy to shape a new one to insert and fit beneath the bearing housing. This job can be done with the rudder still in place. In order to replace the top bearing, it will be necessary to drop the rudder off the boat. The top tiller casting needs to be removed to allow this. About two feet of clearance is needed below the keel for removal of the rudder, either with the boat in a hoist or by digging a hole. Thanks to Phillip Critchley for the sketch.